Uptight elfin historian Brangwain Spurge is on a mission: survive being catapulted across the mountains into goblin territory, deliver a priceless peace offering to their mysterious dark lord, and spy on the goblin kingdom — from which no elf has returned alive in more than a hundred years. Brangwain’s host, the goblin archivist Werfel, is delighted to show Brangwain around. They should be the best of friends, but a series of extraordinary double crosses, blunders, and cultural misunderstandings throws these two bumbling scholars into the middle of an international crisis that may spell death for them — and war for their nations. Witty mixed media illustrations show Brangwain’s furtive missives back to the elf kingdom, while Werfel’s determinedly unbiased narrative tells an entirely different story. A hilarious and biting social commentary that could only come from the likes of National Book Award winner M. T. Anderson and Newbery Honoree Eugene Yelchin, this tale is rife with thrilling action and visual humor . . . and a comic disparity that suggests the ultimate victor in a war is perhaps not who won the battles, but who gets to write the history. M. T. Anderson is the author of Feed, winner of the Los Angeles Times Book Prize; the National Book Award–winning The Astonishing Life of Octavian Nothing, Traitor to the Nation, Volume I: The Pox Party and its sequel, The Kingdom on the Waves, both New York Times bestsellers and Michael L. Printz Honor Books; Symphony for the City of the Dead: Dmitri Shostakovich and the Siege of Leningrad; Landscape with Invisible Hand; and many other books for children and young adults. He lives near Boston, Massachusetts. Eugene Yelchin is a Russian-American author and illustrator of many books for children, including Breaking Stalin’s Nose, a Newbery Honor book; The Haunting of Falcon House, a Golden Kite Award winner; and The Rooster Prince of Breslov, a National Jewish Book Award winner. He has also received the SCBWI Tomie dePaola Award for illustration. He lives in Topanga, California. 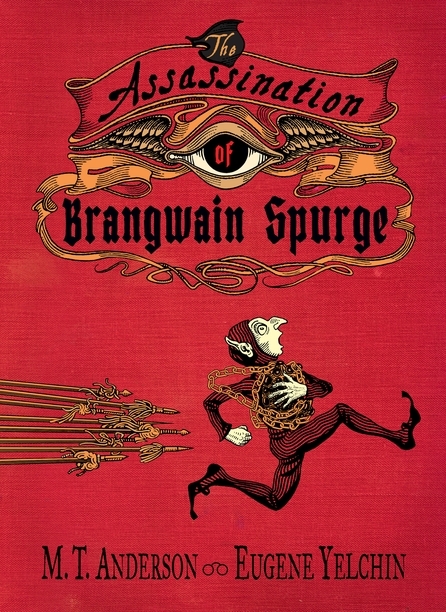 Ten winners will each receive a finished hardcover copy of THE ASSASSINATION OF BRANGWAIN SPURGE. Elves, goblins, and double crosses? Sounds great! I also really like the cover, the artwork is fantastic. The cover and synopsis both strike me as delightfully quirky. The cover looks so amazing and fun and the synopsis sounds awesome! "What do you think about the cover and the synopsis?" The cover illustration is delightful! I know this book would be fun! Personally, giving my experience with YA readers, you might have a hard time getting some readers to pick this up. That said, the story sounds very interesting and the kids that pick it up will likely be glad they did. The cover is hilarious and the premise sounds fun to read! What an awesome cover! It is whimsical and funny and catchy... perfect for YA readers. And the authors never fail!